Jacqueline Smith has been living/protesting outside the Lorraine Hotel for 27 years 95 days. Martin Luther King, Jr. was killed on the balcony of the hotel on April 4, 1968. It later became the National Civil Rights museum. Smith says the motel should be set up to assist and shelter those in need, it's what King would have wanted. 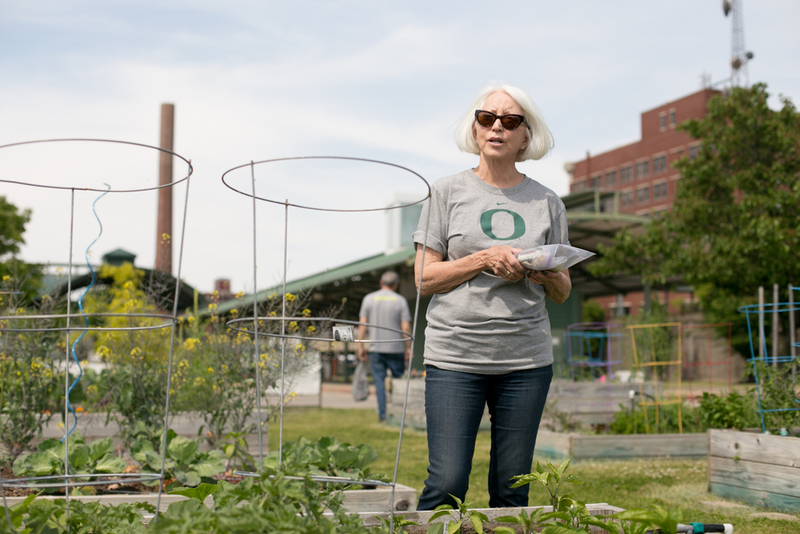 Sharon helped establish the Memphis City Gardens four years ago. They started with four beds and are now up to 20. Clarence takes a break from running the grill at Earnestine & Hazel's to talk with some regulars. He gave me a tour of the upstairs, which used to be a brothel. Elisha has spent the last four days welding his sculpture of the Greek god Apollo. Tennessee brewery brings in an artist every week to produce a piece of original art. Clark and gates take the cheap seats at the Beale Street Music Festival. 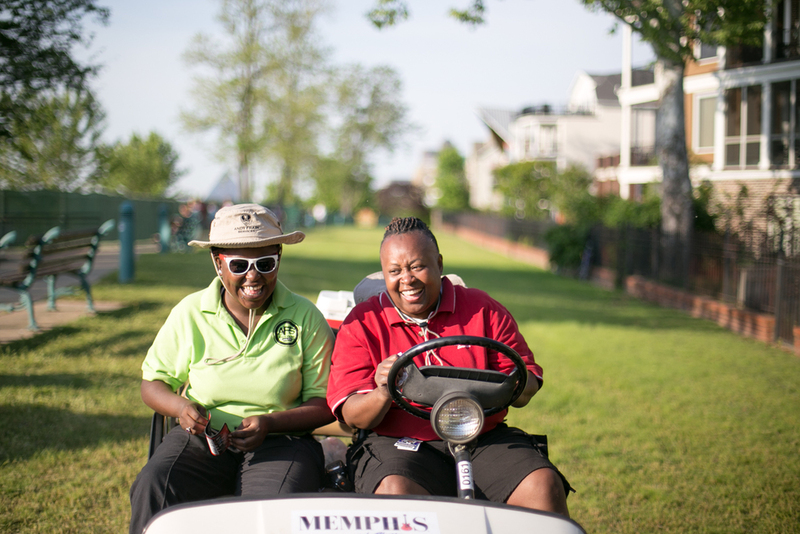 security duo Kim and Donna are keeping things running smoothly at the Beale Street Music festival. John and Jimmel from an Atlanta based R&B group finished up a 7 city tour last night in Memphis. Ernest works on a pastel portrait of Carol. He decided to give her the pretty lady discount. BB King's club has a world class doorman, host and maître d' - Mr. Tat is a dapper dude. Choji the pit bull, Bubba's business partner, watches over their horse drawn carriage. Bubba is quick to offer up directions to out-of-towners. Mia and Eb who are "dating a little" find their way to the next bar. A slow night for a Memphis cab driver of 37 years. Charlotte has been working at CK's Coffee Shop for close to 30 years. One of the last 24 hour spots in town. Her grandson has been working with her for over a year now. Charlotte's grandson, Josh adds up a customer's ticket at CK's Coffee Shop. He typically works the night shift, from 10 PM to 6 AM. Most of their customers tonight are regulars. Last week, the bakers at Gibson Donuts had their work cut out for them. Bass Pro Shop opened a new location and to celebrate they put in an order for 180 dozen donuts. While most people are asleep in their beds, six-seven big Kevin is just finishing his clean sweep on Beale Street. 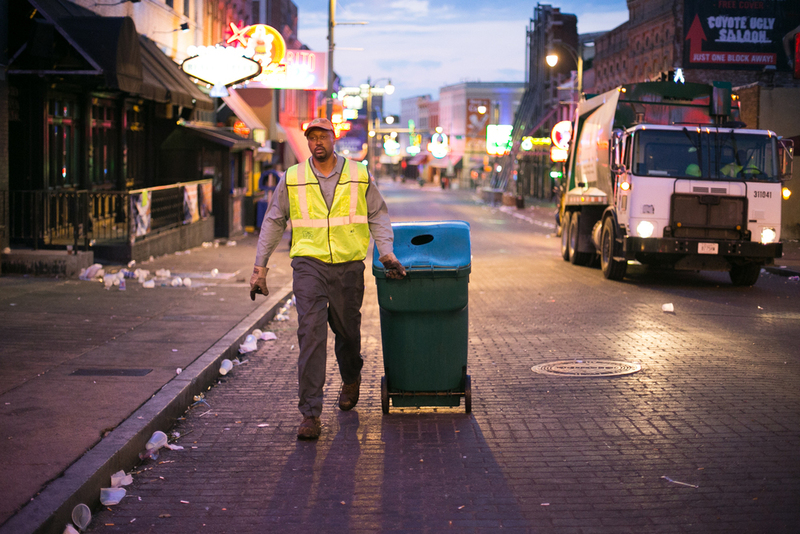 He and his co-worker empty every last trash can that lines the Memphis party strip. Heather and Julia usually run in the afternoons. But with the weather so nice, they've decided to switch it up. This morning, they're shooting for two miles. Thomas sets the drip speed on the Yama tower at Tamp & Tap. On a Monday morning, it's Thomas to the rescue. It's James' first day on the job. He's been washing windows for about 1.5 hours now and doing a damn good job. Keep it up, James. Ashley and Casch take a walk down south Main Street. Casch, a nine year old service dog, might be in retirement but he still sports his vest to get that special treatment he deserves. Courtney gives the rainbow trout pond a scrubbing at the new Bass Pro Shop in Memphis. Next up could be the 84,000-gallon alligator habitat. Sheryl has been delivering mail for USPS for over 11 years but doesn't love it. Tyler is an architecture student at the University of Memphis. He built a giant sculpture with his classmates out of recycled bottles and plastic forks. London and Lasherica are parking enforcers at Parking Can Be Fun garage in Downtown Memphis. Combined, they have a year and eight months of parking experience under their belts. Today is Lasherica's birthday. Join me in wishing her a Happy Birthday!